He studied philosophy under Caldini, but ran away to join a group of strolling players. In 1723, he went to Pavia to study at Collegio Ghislein. There, he began to write and was expelled for producing a libellous poem in 1725. He then studied law at Udine and the University of Modena, where he graduated. He returned to Venice and practised law. His father passed away in 1731 and Goldoni went to Milan the following year. He produced his first play, Amalasunta, a tragedy which failed miserably. His next play, Belisario, a comedy which was more successful, was produced in 1734. Although he produced some more tragedies, it was obvious that his talent lay in comedies. He enjoyed many successes during the 1730s and 1740s. In 1753 he joined the Teatro San Luca and produced a number of plays for them until 1762. 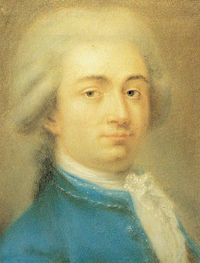 In 1757, after a dispute with the playwright Carlo Gozzi, Goldoni became disillusioned with the Italian theatre. In 1761, he moved to Paris where he became head of the Theatre Italiane. He spent the rest of his life in France and wrote his remaining plays in French. His works include Griselda (1734, Rinaldo di Montalbano (1736), The Two Venetian Twins (1747), The Honorable Maid (1749), The Liar (1750), The Feudal Lord (1752), The Good Girl (1760), The Chioggia Scuffles (1762), The Apothecary (1768), The Fisherwoman (1767) and Memoirs (1787).